The most common issues affecting users. The PSDCovers panel disappeared from PS. We also accept direct credit card payments. 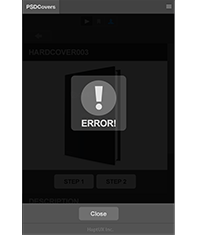 Error notification appears during STEP 1 or STEP 2. PSDCovers asks to Subscribe even after payment. Here are some less common issues. I installed PSDCovers from the Add-on portal but it’s not in my menus. Cancelling is easy and you’ll still have access to our free content!